A breathtaking complex of 1,094 ancient stupas from the 16th century, the main Indein pagoda and surrounding ruins cover the dome of a hill with a sweeping view of the lake and surrounding farmlands. 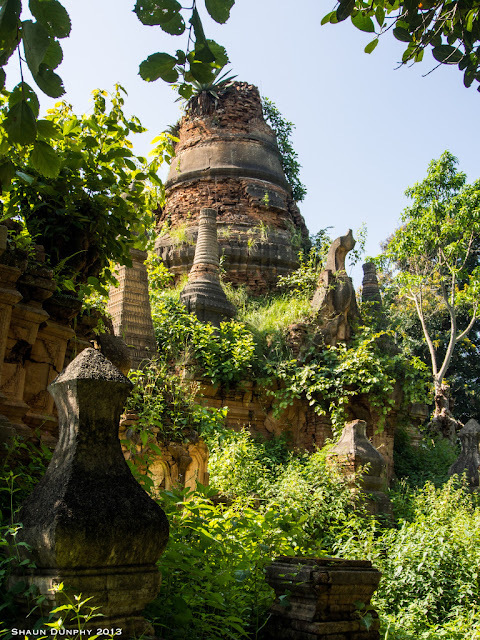 At first hidden from view, visitors must walk up a long roof-covered entrance to discover the hidden ruins at the top of the hill. 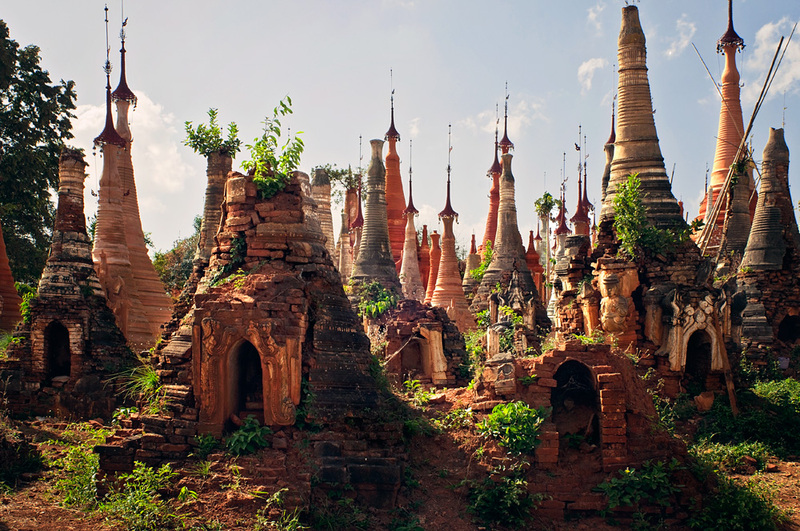 The pointy roofs represent the trunk of an elephant. 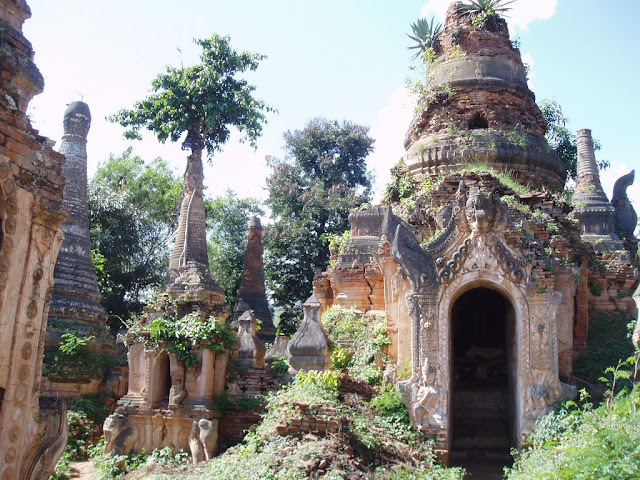 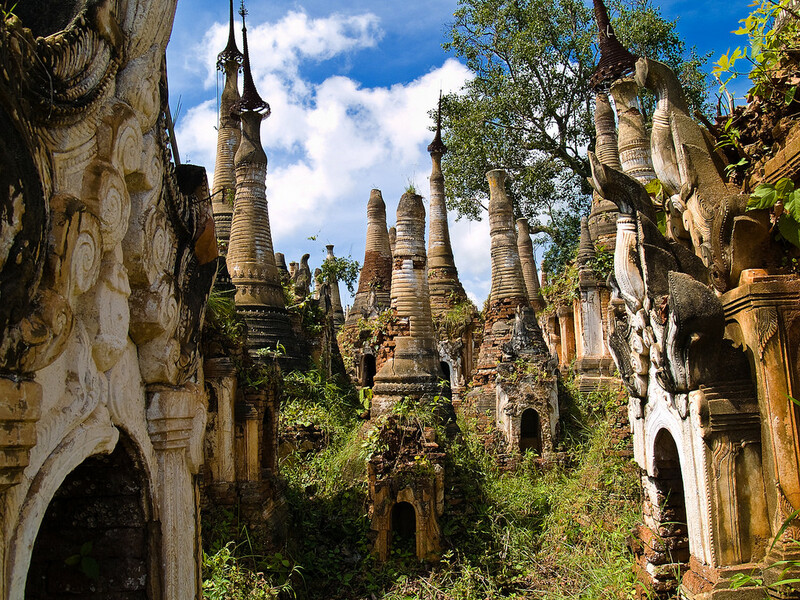 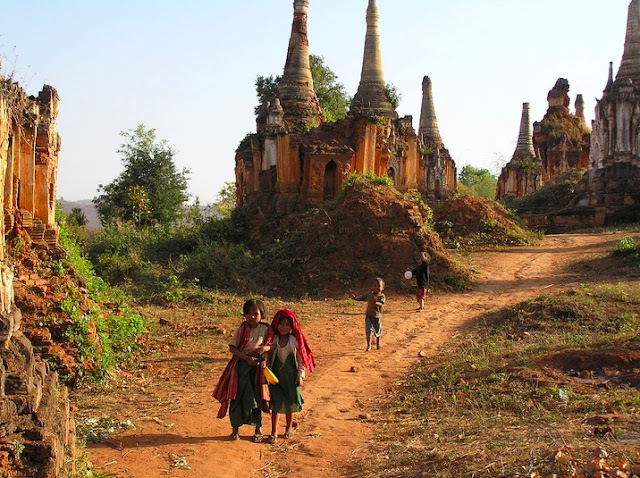 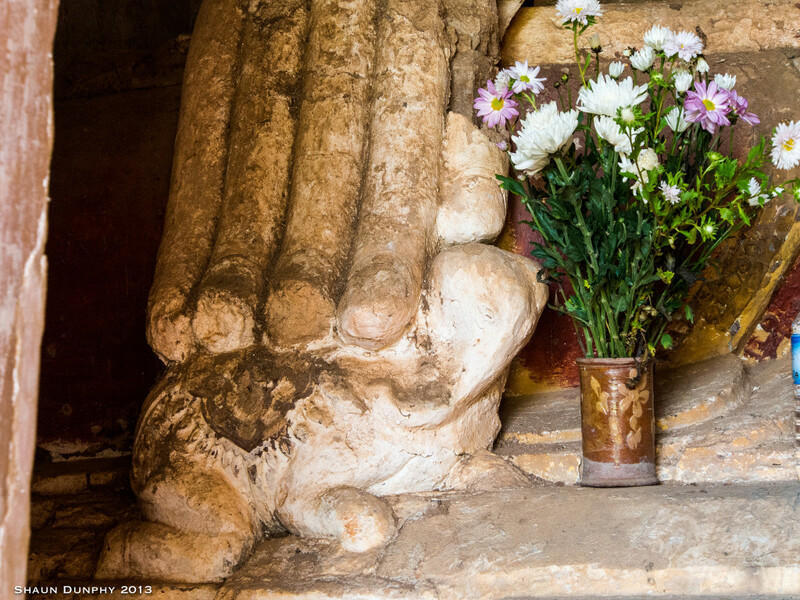 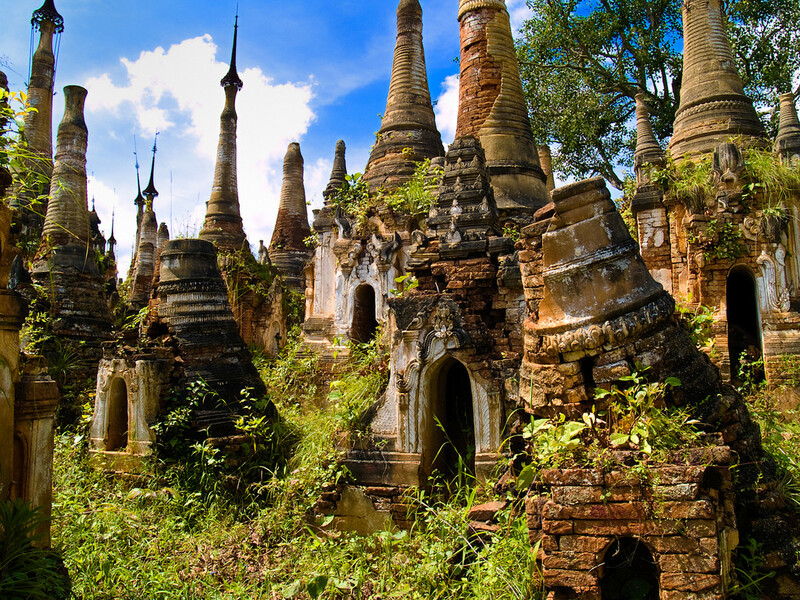 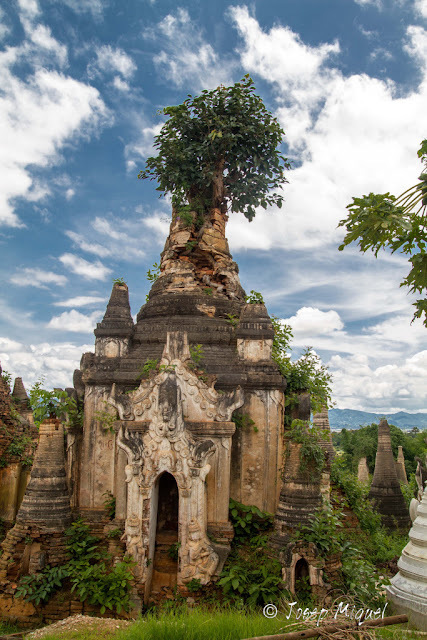 These crumbling meditation shelters or stupas, more than a thousand of them, have no records in Myanmar history of ever being built.One theory is that the Shwe Indein Pagoda complex was built by the Indian emperor Ashoka, who sent out monks in the 3rd century BC across Asia to spread Buddhism. 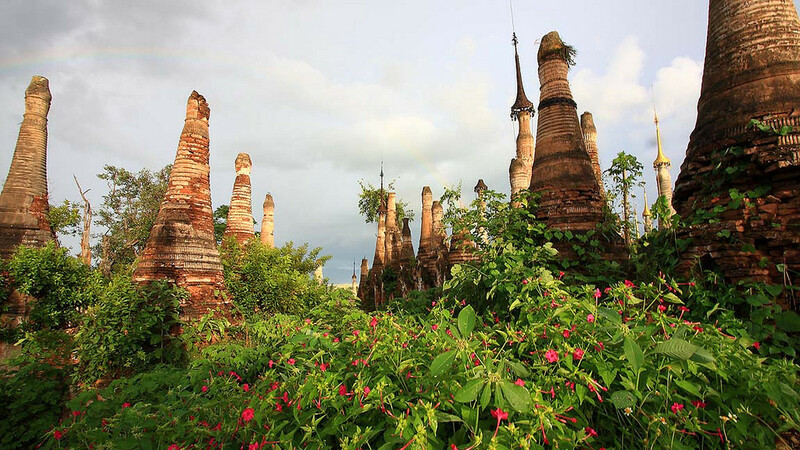 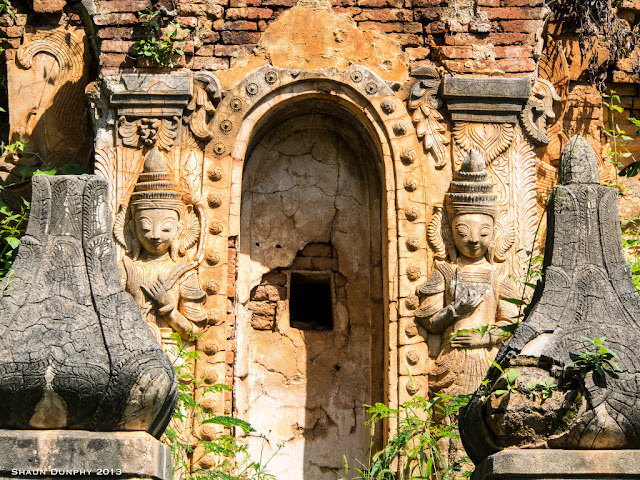 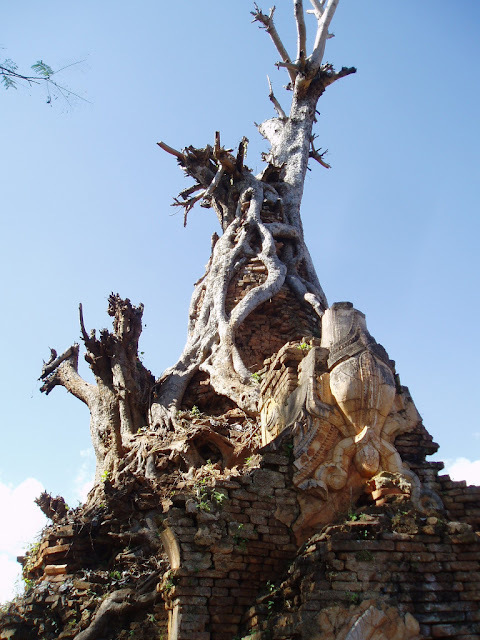 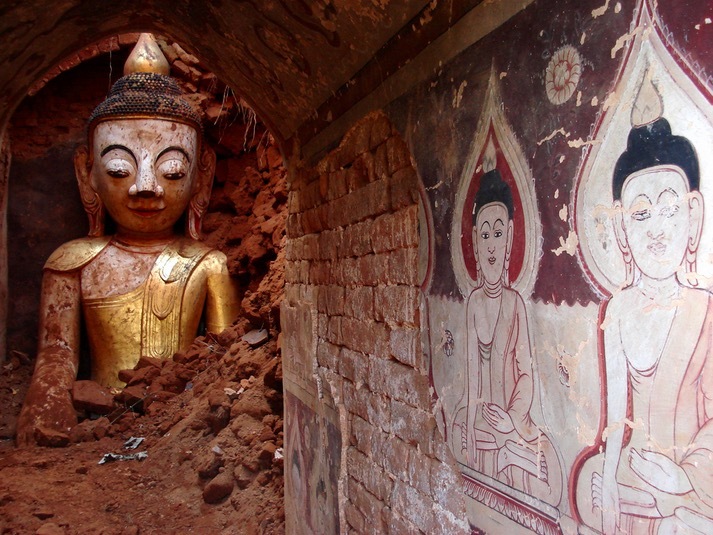 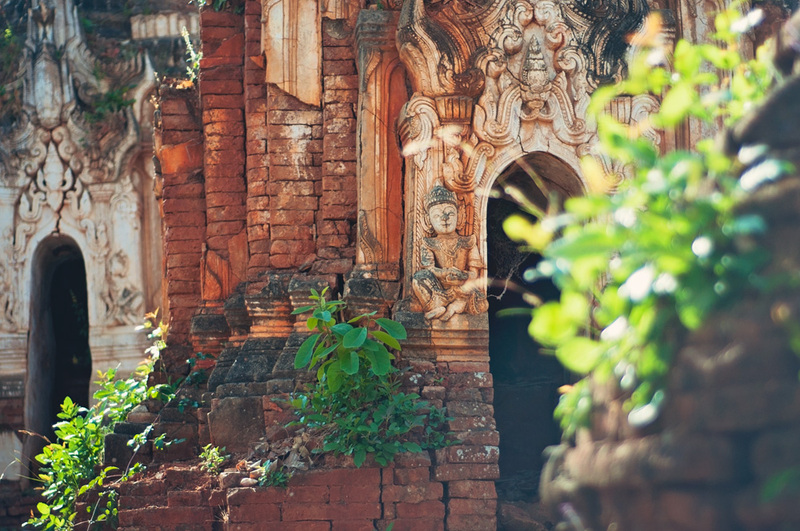 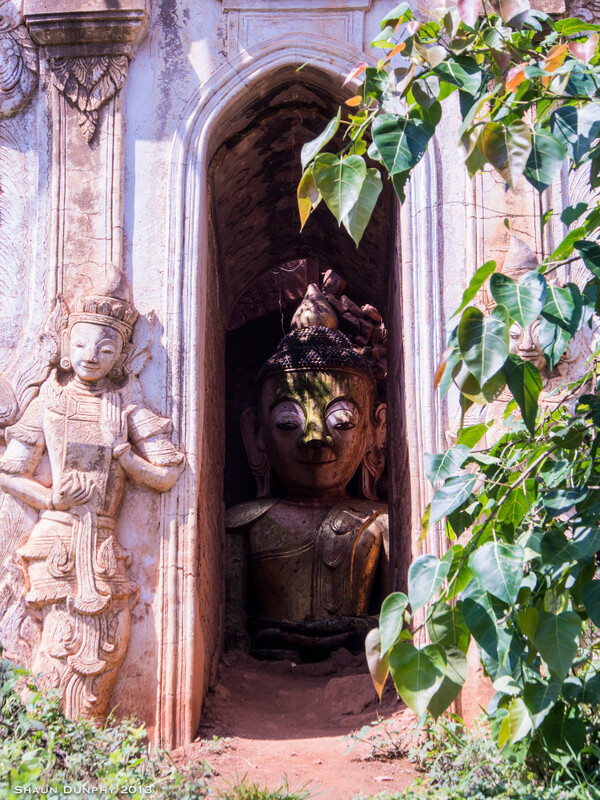 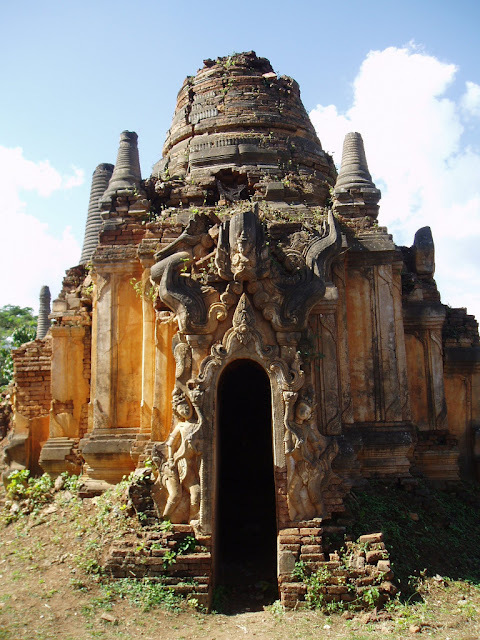 However, there is no archaeological evidence to support this and other accounts says a king in central Myanmar built the mysterious pagodas in the 17th century after returning from the war in Ayutthaya. 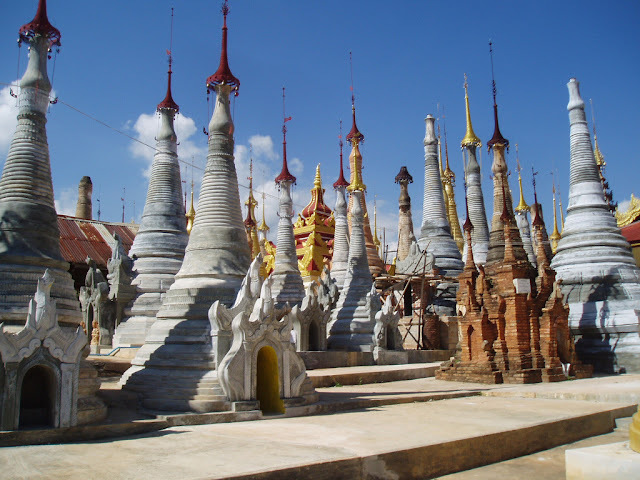 While the pagodas surrounding the temple in this part of complex have been restored by Burmese donors in a bright gold and white stucco finish, there are hundreds of ancient undiscovered ones to be found in the area, unknown and mysterious even to many of the local people, deep in the thick of the jungle. 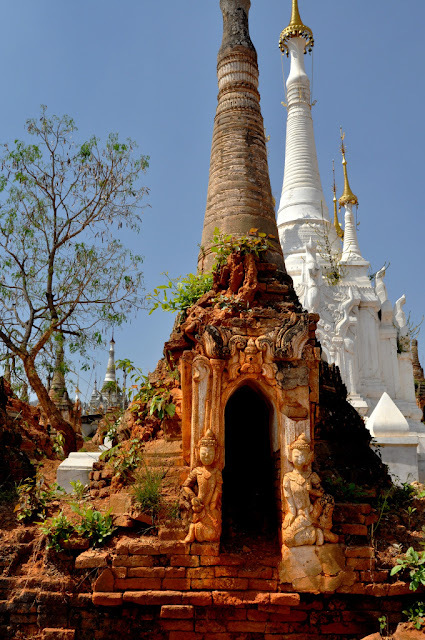 This corner of the Inle Lake down the narrow Inn Thein Creek has not gone untouched by the influence of foreign tourism, but there are hidden treasures to be discovered by taking less-worn tracks that veer off the main path towards the main temple, Shwe Indein Paya, at the top of the hill.